Despite Real Madrid’s recent issues and inconsistency, Diego Simeone opted to go for a less man-marking, man-orientated defensive system, particularly in a mid-block, than how his side approached Barcelona this past October. In all honesty, this 0-0 LaLiga draw at the Wanda Metropolitano was a disappointment for fans and neutrals alike; the only on-the-surface entertainment was Sergio Ramos’ bloody nose off a Lucas Hernandez high-kick (if only slightly high) and a last-ditch tackle by Lucas to block one of Cristiano Ronaldo’s shots with two minutes left. But, per usual, we’re not here to offer shots on goal stats and to describe the far and few tangible points of entertainment in this match – we’re here to discuss Atletico Madrid’s defensive system against Real and how it differed to their system against Barcelona. How did Atletico Madrid defend against Barcelona during the 16/17 season? Before we analyze how Atletico set up defensively in their first meeting with Barcelona this season, we need to analyze how they managed to disrupt Barca’s build-ups and midfield penetration from the 16/17 season. It’ll give us some insight into how coaches, like Simeone, adjust when the opposition loses personnel and gains a new coach. Move as one unit, zonally, and set up in a 4-3-3 down the central axis. Use three forwards to match with Barcelona’s three centre-backs. Transition to tighter, aggressive man-marking on Barca once play is forced to a wide centre-back or wing-back. Have a look, below, at Atleti’s 4-3-3 high-block when they hosted Barcelona from February of this year. As you can see, Atletico are set up in a 4-3-3 with two lines of three parallel to each other down the central axis. But what happened when Barcelona made it to the midway line? How did Atletico set up? Well, with Barcelona in their 3-5-2 shape to build into Atletico’s half, Gerard Pique was given the license to drift further into more advanced positions compared to his centre-back peers, while Atletico were in a very narrow 3-5-1 of sorts with one key feature to their low-block. As we can see in the screenshot above, the ball is about to be switched over to Neymar (orange circle) and we see that Sime Vrsaljko (yellow circle) is disconnected from the rest of his back line due to being on man-marking duties for most of the match. Furthermore, Atletico rarely attacked down their right side in this match out of fear of losing the ball down Neymar’s flank. They did not want to give the Brazilian superstar an option for a quick counter-attack down his side. This, itself, is a huge reason why Simeone opted for a more man-to-man approach against Barcelona in October. How and why did Simeone change the defensive system against Barcelona this season? So, how did Neymar’s departure to Paris Saint-Germain change Barcelona’s effectiveness and Atletico’s defensive strategy? Well, Simeone knew right away that whichever right-back he chose, either Juanfran or Vrsaljko, they didn’t have to worry about whomever Barcelona put as their left-sided forward. Atleti simply didn’t have to use a strict man-maker down their right side anymore. Neymar was gone. So, instead, they could focus on double-marking Lionel Messi during Barca’s build-ups instead. Luis Suarez’s dip in form. They didn’t need to double up or use zonal cover on the slumping Uruguayan. Ernesto Valverde’s more triangle-based positional play system made Simeone realize they didn’t have to worry about their press or man-marking system being negated by more direct passes and through-balls (Barca under Luis Enrique). Barcelona became narrower in their possession formation which helps a tighter, man-orientated system. These reasons aside, let’s get into the match and defensive system. Barcelona and Atletico both used a 4-4-2 in this match with the Catalan giants using Andres Iniesta operating a bit wider in the attacking-half and more advanced in build-up phases. In addition to this, Ivan Rakitic was used as a double-pivot with Sergio Busquets. Moving on, let’s break down how Atleti’s man-marking mid-block system worked. We’ll break it down into three separate mid-block phases from the match. 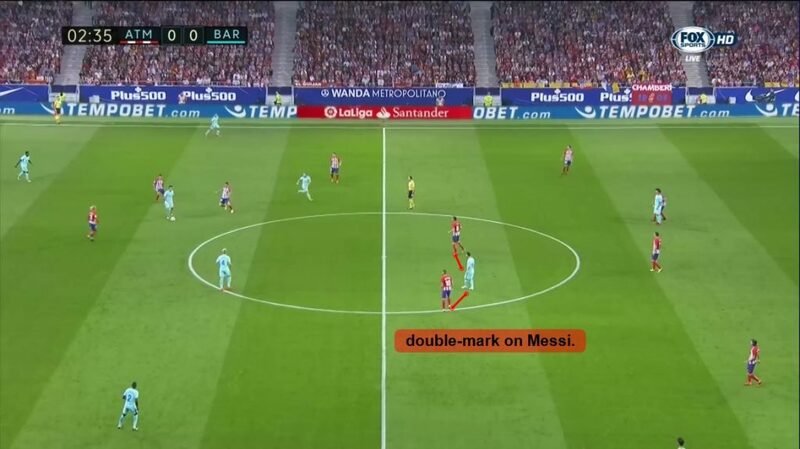 With Valverde’s side in possession, Atletico unleashed their man-marking system from the opening whistle. Simeone’s side opted to man-mark Barca’s midfield, the ball-side full-back, and Messi. Have a look below. Next, we see that Andre Gomes has passed backwards to Nelson Semedo which triggers Yannick Carrasco and Antoine Griezmann to double-press and close off Semedo’s exits. Soon after, Semedo tried to pass upfield and it nearly resulted in a turnover as the ball deflected off Carrasco and out of play. In the next mid-block phase, we’ll see how Atleti kill off Barca’s access to Busquets, prevent the play from going centrally, and force Barcelona to switch to their left side so they can target Samuel Umtiti. In the next screenshot, we see that Atleti’s midfield and forward lines aren’t flat, further illustrating their more man-orientated marking. Next, as Gomes passes to Rakitic, Atletico trigger their more aggressive man-marking. Interestingly, though, we see how Griezmann stays in a ‘containment’ position between Pique and Busquets. In addition, we see that Angel Correa man-marks Busquets as well, making the veteran holding midfielder virtually unplayable. Moving onto the next annotated image, Pique is passing to Umtiti to switch the play to Barca’s left-side (Atletico’s right side) which triggers Los Rojiblancos to initiate their aggressive touchline man-marking press. However, just before that, we see Saul Niguez dropping deeper to occupy a zonal position in midfield. As Saul dropped to his zonal position, Umtiti passed it to Jordi Alba who passed it back to the young centre-back. As a result, this triggered Atleti’s 5v5 touchline press. Next, while the 5v5 touchline press is taking place, Carrasco and Saul are in their more zonal double-pivot set up, with the Belgian winger closer to a man-marking role on Rakitic. With Umtiti’s options all marked off, and with no exits, the ball made its way back to Marc-Andre ter Stegen. However, there was another way Simeone’s side defended when their Catalan rivals switched the play to the left (Atleti’s right). Below, we see that the ball is travelling to Barca’s left side and Saul is, yet again, going to his zonal role. But, the marking style will change elsewhere. As the ball gets passed back to Umtiti, Correa stays in a ‘balanced’ position – he doesn’t press but he doesn’t give too much space, either. He contains. Soon after, Correa screens the passing lane to Busquets by staying close to the defensive midfielder, but staying in between him and Alba, as well. Meanwhile, Griezmann stays closer to Pique to get ready to press Barca’s best ball-playing defender and Saul stays zonal in case Busquets manages to get inside. Lastly, Carrasco man-marks Messi in the mid-block set up. With Barcelona struggling to build up, Umtiti passes horizontally back to Pique. This switch to Barca’s right side triggers another man-marking press by Atleti. As it happened, ter Stegen gets the ball and redistributes it back to Umtiti who passes it to Iniesta who drops from deep to help with the build-up. This created a 4-3-3 and Barca managed to break Atleti’s pressure. Have a look, below. Well, Carrasco and Saul don’t press Rakitic or Busquets. Instead, they double-mark Messi and let Barca come to them. They’d rather have Rakitic or Busquets transition forward with space than Messi, of course. As a result, Atletico transition from mid-block man-marking system to zonally based low-block. Have a look. As you can see above, two Atleti players go man-to-man in correlation to the ball-player while another six retreat to form a compact zonal box. This makes it very hard for Barcelona to quickly enter the Atleti’s penalty area and they now have to restart the attack due to the compactness and numbers. As you can see, aside from either Saul or Carrasco, who were more zonal based when the ball reached Alba or Umtiti, a majority of Los Rojiblancos were very man-orientated in a mid-block. So, with Real Madrid, a team that is more versatile than Barca and less fixated on BarcAjax ideals, especially for build-ups, how did Atletico adjust their mid-block to neutralize Real’s strengths? How did Atletico change their defensive system for Real Madrid and why? To put it simply, Real Madrid are more tactically versatile than Barcelona. Couple that with their incredible individual talent, in all areas of the pitch, and you have the reason why they’re very difficult to play against. Now, despite their inconsistency this season, they were unlucky against Levante, Real Betis, and Valencia this season. They should have won those matches, in all honesty, due to the chances created. But, here they are – struggling. Anyway, this brings us to Simeone’s reasoning for ditching a slightly more open man-marking system for the more zonal-based 4-1-4-1 mid-block they used against Real. That versatility mentioned above, is something that Barcelona lacks; couple that with Barca’s dip in defence-to-midfield build-up from-the-back cohesion and you have the final reason for Simeone opting to go for a man-marking style against Barca. A slightly expansive man-marking system isn’t as much of a suicide mission as it used to be against Barca. Simeone knew this. So too did Jose Luis Mendilibar with Eibar this season. But, Real Madrid don’t honour and play by BarcAjax philosophies. They don’t have to build up from the back with short, quick passing; always from defence to midfield for spectacle reasons. No, they’ll gladly go long, they’ll push full-backs into forward positions, and they’ll use five or six players in their own half to build up the play. This versatility is why Simeone opted to go for a safer, more zonal approach. For a quick reference between both defensive blocks against Barcelona and Real Madrid, look below. Another example of how Real Madrid’s build-up differs from Barcelona’s, which in turn influences Atleti’s defensive strategy, is how many players Real deploy in their own half. Above, we can see how Los Blancos have nine players in their own half and they’re spread out horizontally. Simeone will never push seven or eight players that high up into Madrid’s half in a tight man-marking style. It is too risky. Furthermore, there’s a similar situation near the touchline that resembles another phase of play from Atletico’s match against Barcelona in October – the 5v5 touchline press. Now, against Real Madrid, there was a similar scenario. Above, we see how both Barca and Real have five players down the right-wing and right half-space. So why didn’t Atleti press man-to-man as they did against Barcelona? Barcelona have seven players total in their own half while Real have nine. Against Barcelona, Atleti trapped both centre-backs. Against Real, Isco’s free role down the right wing frees up Ramos (out of frame). If Griezmann decided to press Raphael Varane, the French international would simply pass it to the left toward Ramos who is free. That would leave Atletico scrambling. Atleti decided not to press in the same 5v5 touchline as they did against Barca simply because Real Madrid had more options to beat the pressure due to Isco’s free role. Again, how Madrid build-up is more unpredictable. Instead, Atleti played it safe, forced Madrid to switch the play, and screened-off Casemiro and Luka Modric in the process. However, there are other reasons for Atleti’s different defensive approach against Zinedine Zidane’s side. Stay tuned for part 2.